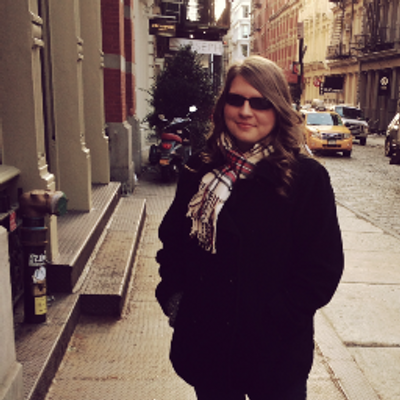 Top Ten Tuesday is a meme created and hosted by The Broke and the Bookish. This week's topic is: Last Ten Books that Came Into My Possession. I translated that to mean All the Books I've Bought Lately which made me swiftly realize that a book-buying ban should definitely be in effect for me. P.S. I Still Love You by Jenny Han --- I recently ran through To All the Boys I've Loved Before and loved it so much. On my next Barnes & Noble trip, I couldn't stop myself from picking up the sequel. 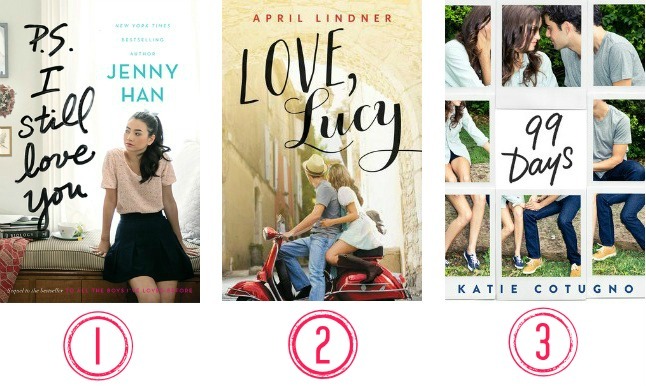 Love, Lucy by April Lindner --- This one is set in Italy. The main character is backpacking through Europe and I've been in a travel mode lately (check out Wanderlust, where I take readers to the United Kingdom). There's a romance involved and it sounds like a total summer/beach read. I may not have a beach but I'm going to enjoy it all the same. 99 Days by Kate Cotugno --- I bought another summer read, you know, the cutesy-sounds romantic type of books. Plus, I'm in love with this cover. I don't know what it is about it but it is just awesome. Cruel Beauty by Rosamund Hodge --- A retelling of Beauty and the Beast. Yes, please. And the cover, shaped like a rose. Isn't that gorgeous? It particularly wanted me to buy it and take it home. 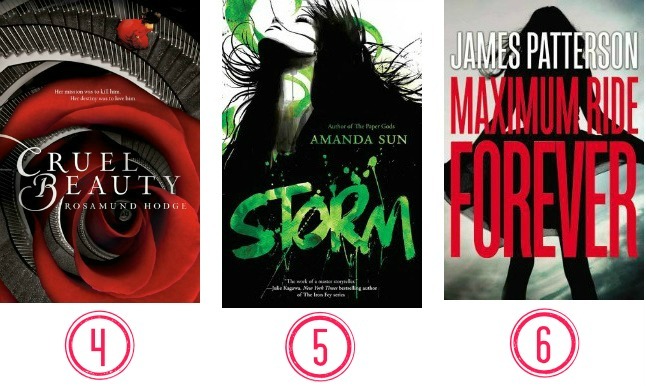 Storm by Amanda Sun --- I just finished Rain, the second book in the series and can't wait to dive right into Storm. This is the final book. Who knows how it will end? And it's set in Japan -- think captivating and beautiful culture. Maximum Ride Forever by James Patterson --- For some reason, I thought this series was over. Didn't it end at the 8th book? Am I the only one who thought that? Both unfortunately and fortunately, there is a new one. What more could possible happen with these angel-bird kids? Still, I'm going to read it all the same. Snow Like Ashes by Sara Raasch --- This one sounds so good. Warrior faces dark magic, in love with her best friend who happens to be royalty. The sequel is coming out in October so I'll probably read it then but I can't wait! 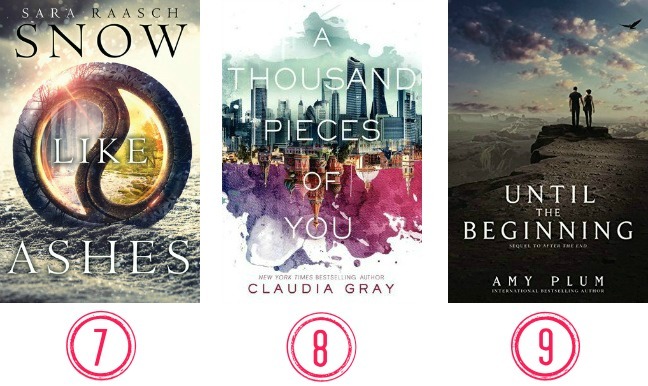 A Thousand Pieces of You by Claudia Gray --- Parallel universes: I am so in! Claudia Gray and I go way back; I've been reading her since her vampire series so I am most curious to see what she has done with a bending-reality sci-fi book. The sequel releases in November. Until the Beginning by Amy Plum --- No, I haven't read the first one yet so I can't tell you what this one is about but it's Amy Plum. I loved her other series so I'm hoping to love this series too. 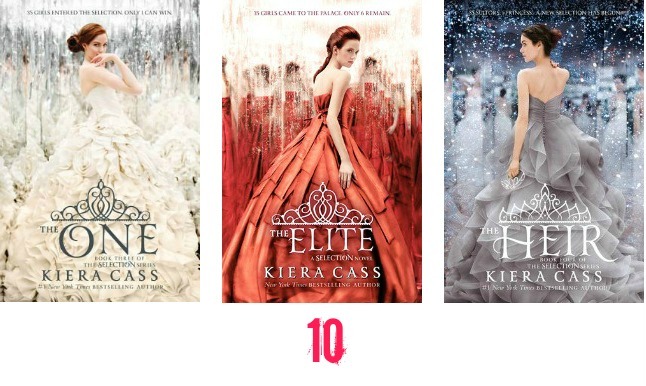 The Selection series by Kiera Cass --- I know there is a lot of mixed reviews on this series. Back in the fall, I read The Selection and really enjoyed it. I've always wanted to check these books out. Before Kiera Cass was a writer, she was making Twilight-themed videos with a friend on YouTube (under the name TwiCurls); they were hilarious. When I heard she had a book coming out, I couldn't wait for it and I can't believe it has taken me so long to pick them up. What books have you gotten lately? And what books should I read first? What a wonderful list. I just recently got the Selection series as well. I need to go on a book buying ban ASAP. A Thousand Pieces Of You sounds really interesting, the idea of different realities just fascinates me. I really hope you'll enjoy it. Great list. 99 Days is one that I have wanted to check out for a while because it sounds so good. Have an awesome week. I have only read SNOW LIKE ASHES from your list. It wasn't what I expected - I ended up really liking it but for different reasons than I thought I would. I've always wanted to read the Selection series! Loving the summer reads and pretty much all the other books on this list - I would be very tempted by them in a bookshop, which is why I try not to go into them too often! I just bought A Thousound Pieces of You recently. I haven't gotten to it yet tho so I hope it's good. I really liked Cruel Beauty. It was kind of weird. I hope you enjoy them all! Thanks for visiting my blog earlier. Great list. A few of these have sparked my interest and sit on my "to read" shelf. Happy reading. I heard a lot of positive things about 99 Days? Don't know if I'm going to like it, though I do have it on my TBR list. I just haven't picked it up yet. Interesting premise, and I want to see how the mother-daughter relationship plays out.